This week was unusual for many reasons. Some of which I will get into later, but one of the bigger highlights was my participation in Ignite Stamford #5. The premise of Ignite Stamford is to gather several people who give a short presentation featuring 20 slides that auto-advance every 15 seconds. It's very much like scripted ad-libbing, since you create the slides yourself but you have to be on your toes throughout. I talked about welding, and one of the features of that activity I highlighted was the fact that if I wanted to put anything on wheels in my house, it's going to have wheels on it. 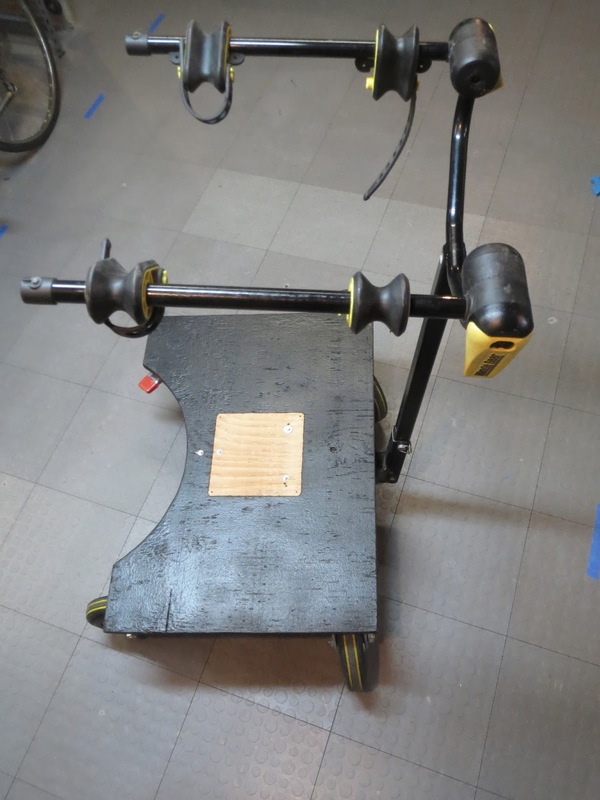 One day I was in my shop and realized that I had four massive casters that weren't attached to anything. A sensible man would have put the wheels away until he knew what he was going to do with them. But you know me better than that. A glance to the corner of the welding room showed me a big piece of 3/4" plywood that was leftover from a project I had made for my grandmother (which was a series of wooden discs screwed together and covered with carpet so her living room chair could sit on it and be at a more comfortable height). It was hanging around in the shop for more than a year, but at that moment I was compelled to cut it exactly so. 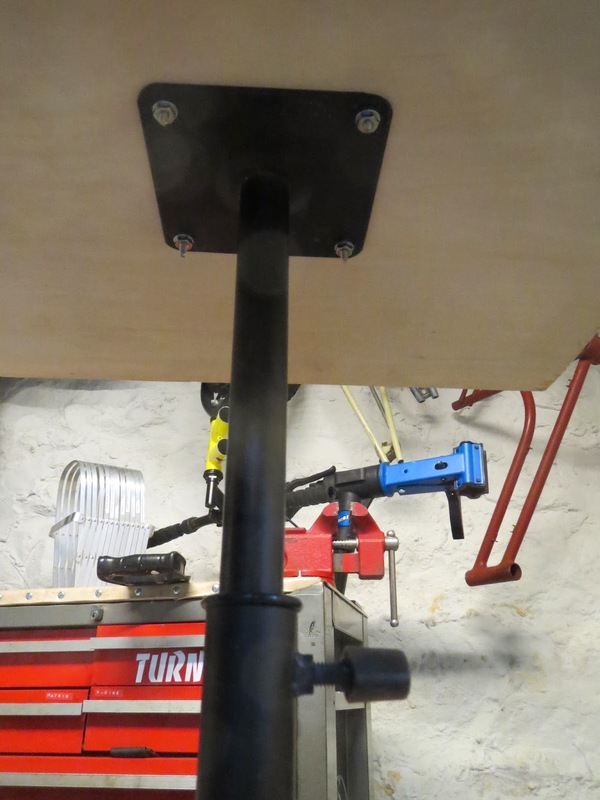 Next, I found myself a square piece of wood that was leftover from the one-sheet workbench project I made (it was one of the pieces that traveled six miles on the back of my homemade cargo bike) and attached a telescoping speaker stand to the center. Before I put the two halves of the speaker stand back together, I dropped a spring in the bottom so in case the little thumb screw failed and the thing fell, the landing would be cushioned. When I was done, I had myself the perfect rolling laptop stand. As you can see I ended up reshaping the bottom with a jigsaw and painting the whole thing black to make it look nice. It was perfect, I thought: very heavy at the bottom so it would be impossible to flip over, it could be lowered to desk height, I could sit on a barstool and rest my feet on the base if I wanted, and it looked pretty good. But then the next morning I found myself with a lot of post-build remorse; the workshop equivalent of looking at the person you met at a party last night early the next morning and recoiling at what you had done in between. What was I thinking? I already have a portable rolling table made from a tag sale find, and casters heavy duty enough to support the weight of a Smart Car are completely unnecessary for a four pound laptop. Not only that, it was too big, heavy and awkward to carry up stairs. Luckily, a few weeks later, I was able to convert this ridiculous build into something useful. 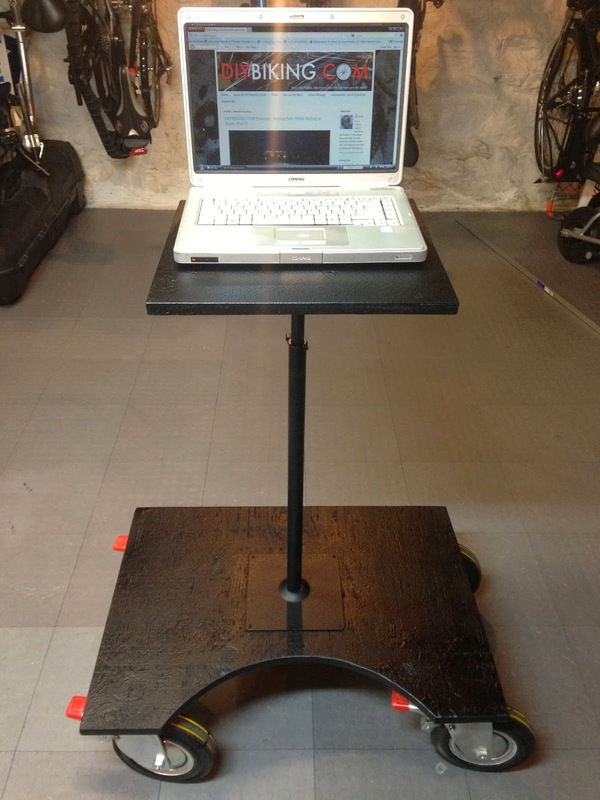 Or, at least, more useful than a massive rolling laptop stand. It all started when I was sorting through a tub filled with metal bits in the welding room and came across this gem which, as you may recall, I found on a bike ride to New Canaan nearly three years ago. Yes, it's the back of a trailer hitch, and I fit it in my bike bag and carried this heavy chunk of steel with me for the rest of the ride. It's where you and I differ. I know. The first thing I did was cut a beefy L-bracket and make heavy duty metal tabs that could fit on the sides. Then I did a little welding - some of the neatest beads I ever made, in fact - because I was using the proper welding tip (more on that later). Next I removed the speaker stand from the base - I practically needed a spotter to help me flip the thing over - so I could center and attach it properly to the bottom. As I did this, I played around with an old Rhode Gear trailer hitch bike rack I have and never use (thanks to the interior bike rack I made for my Honda Element) to make sure everything would fit the way I thought it would fit. 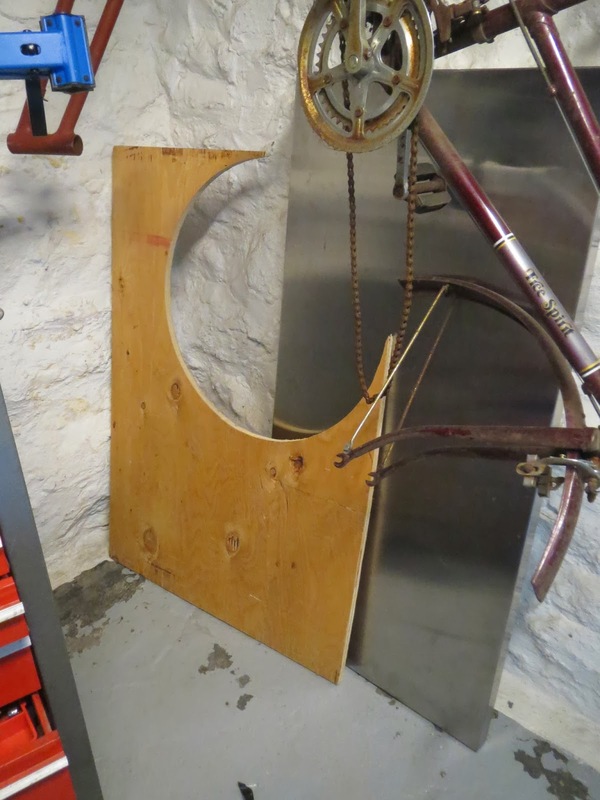 When I had my found piece of metal bolted to the bottom, I summoned up my adrenaline glands and flipped the base back over so I could put the hitch rack into place. Yeah, this is more useful: I have a few more bikes than normal these days (don't ask) and it's more important for me to have bikes on a rack I can roll out of the way anytime than it is for me to stand at a computer while watching 'Breaking Bad' with commentary on DVD. So the build - or rather, use of the casters - was salvaged for now and I was again reminded to never, every throw anything away. I picked up that trailer hitch bit in 2011 because I knew it would be useful someday, and it was. I can use the Rhode Gear trailer hitch that was otherwise being unused…and I didn't have to modify it in any way. And finally: inspiration for what you make tomorrow could come from something you made yesterday - even if you have post-build remorse. Thanks for reading and thanks for riding. Epic! I love the idea! You can wax off your problem, fold it upward in addition to retailer it apart as part of your car when you find yourself away riding. Quite hassle-free. When placed on your current problem, it permits you to simply access the rear of this auto while not having to wax off, for more information click here best hitch bike rack.